It took balls to make Chappie. In a genre that already pushes the envelope of believability, here is a sci-fi film that goes even further down the road of cinematic experimentation than most. It’s not the base story that’s so original, that of an intelligent robot that melts our hearts with his surprising humanism. We’ve seen that theme done very well in Short Circuit, a comedy classic that also brings about a few tears. No, it’s the surroundings that make Chappie a dangerous film, one that could go too far and burn every bridge in the process. Set in South Africa, featuring rappers as actors, bringing an Alien vibe back to the screen, and, oh yeah, making a childish machine not only the main character of the movie but a blanket representation of mankind as well. Not your typical drama, not your usual sci-fi, and definitely not a movie you’ll see again. Chappie is one of those very few films that sticks with you after you leave the theatre, a bug planted in your brain, and a reminder that we can still be impressed. In Johannesburg in the near future, crime will have elevated to such high levels that extra measures will be taken. A weapons company called Tetravaal will develop a series of robots called Scouts who will act in the place of police forces, taking all the risks and stamping out crime with no fear. The plan works, the company makes money, and the city is safer. But the developer of the program, Deon Wilson, has bigger goals in mind. He has created an artificial intelligence that should work within a Scout body, producing the very first free-thinking robot. Unfortunately, this technology, the machine, and Deon himself are abducted by a bumbling band of criminals called Ninja, Yolandi, and Amerika. The trio name the robot Chappie, become his parents & friends, while Deon is seen as a god-like Maker. And as Chappie quickly learns to adapt to his environment, he will be forced to make decisions based on a morality he doesn’t understand, a humanity that is just beyond his reach. Neill Blomkamp has a certain vision, there’s no doubt about that, whether you share that vision or not. His films deal with a certain set of issues; segregation, racism, class warfare, the fear of the differences between us. And these themes always come to life in his movies in sci-fi form, in South Africa, making no bones about their social meaning. His first film, District 9, is at once a total alien gross-out and a poignant message on apartheid. His next film, Elysium, could be considered a bit of a sellout and a total bust, but it still delivered the same sentiment; that the struggle for equality is both very real and very difficult. Now Chappie, where the topic is broadened to include the meaning of life, questions about god, and the future of mankind. 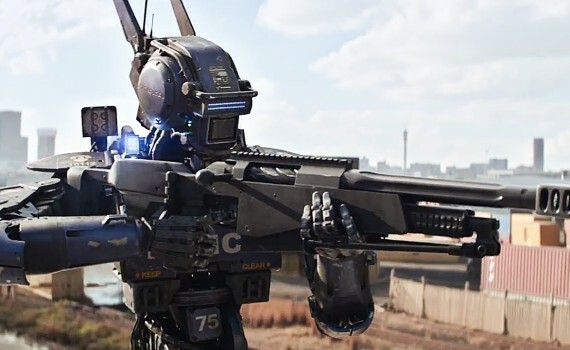 Like I said, you’ve got to have balls to tackle these issues while riding a robot, his gangster pals, and the slums of Johannesburg, but Blomkamp hasn’t backed down from a fight yet, and I doubt he’ll start any time soon. The cast of this film is the oddest part about it, adding to the danger & real possibility that it won’t sit well with many audiences. The voice of Chappie is none other than Sharlto Copley, Blomkamp’s pal, star of D9, villain of Elysium. He is hands down the best part of the movie. 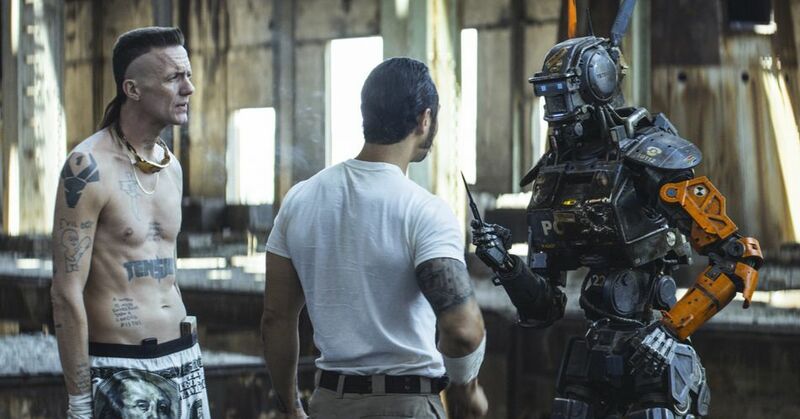 He makes Chappie real, brings emotion to a machine, and grows alongside the character. His “parents” were played by a pair of rappers stylized Ninja and Yo-Landi, also their names in the movie, who make up the rave group Die Antwoord. These aren’t actor, and you can tell, but they bring something pure & dirty that fits the feel of the film. Watch any of their music videos and you’ll see why it took guts to cast them in this film. Patel, Jackman, Sigourney Weaver; these are the recognizable names, but perhaps the only boring parts of the film. Their acting ranged from OK to awful, leaving the story (and Chappie) to flounder alone. And here’s where personal taste steps in. I applaud the chances taken by this film and think that the robot at least worked the way it was supposed to. Die Antwoord made the city and the danger feel real, the sci-fi plot was one that I loved, and the action was always intensely exciting. 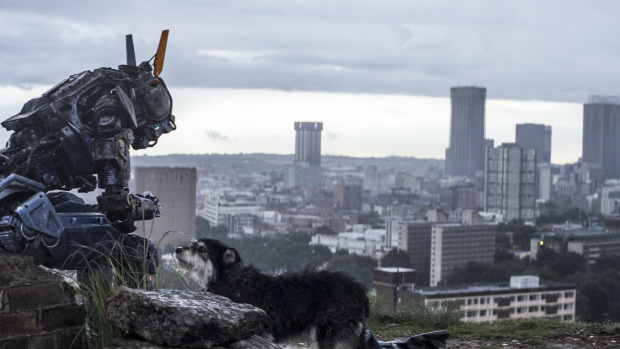 Perhaps the acting wasn’t the best, perhaps this won’t be a universally appreciated picture, but Chappie is uniquely told, crafted, and delivered, which has got to be worth something.